Good morning. Only 10 more days for THE day. Yup, Christmas is just around the corner. I mailed my last Christmas cards yesterday and I hope they will get to my friends in time. Have you mailed all your cards yet? Yesterday we also put our Christmas tree up and decorated the apartment. It looks great! When do you usually decorate your house and put up your Christmas tree? We wanted to do it last weekend, but we ran out of time. If you want to get an extra present this Christmas, hop to the Crafty ribbons inspiration blog. There we have a Christmas event going on and each day one of our generous sponsors is offering a wonderful prize to the lucky winner. Today, for example, we are sponsored by The paper shelter and they are offering this to wonderful prize to the lucky winner. I made a Christmas card using one of their adorable images. I only used some red, white and kraft cardstock for this card. For the background I used the white cardstock which I embossed with Cuttlebug's swiss dots embossing folder and then inked it with ink pad. I coloured the image with distress inks and I also added glitter glue on the white parts of Santa's dress. 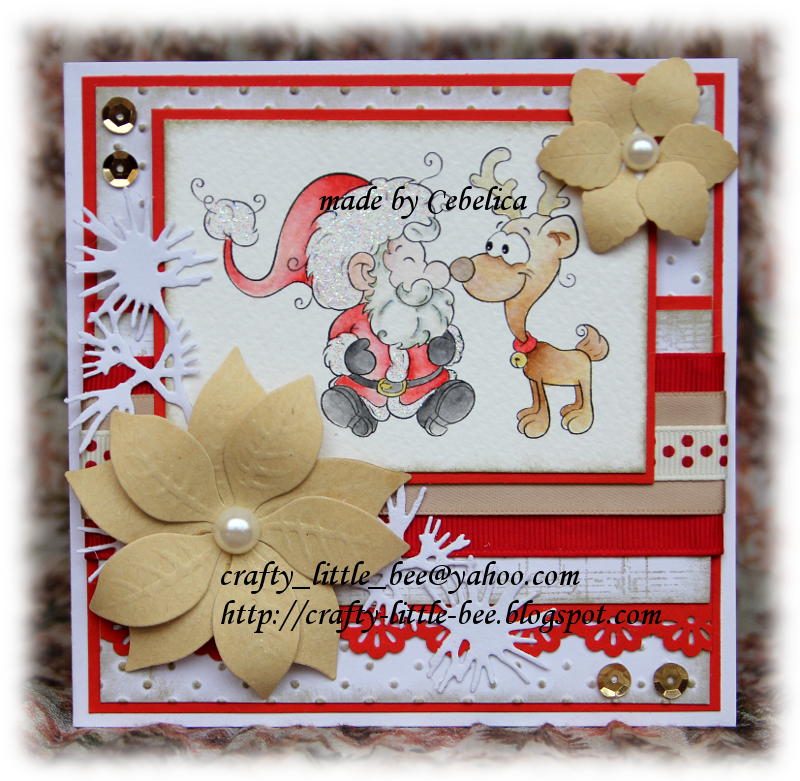 Big poinsettia is Marianne design die, small poinsettia is LLLC die and the "leaves" are Tim Holtz die (cut with the Festive greenery die). Sequins and pearls are from my stash. 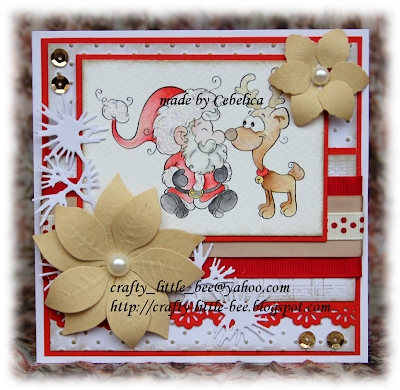 I also used 3 ribbons on my card - ho ho ho ribbon (back side), tan satin ribbon and swiss dots ribbon. They are all available at the Crafty ribbons store. :( **sigh -- there's still time; right..!??!! What a merry & funny Christmas card!